Bristol eco-village set up camp this week with huge support from local people and activists from all around the country. The off-grid, urban community kicked off last month on a patch of waste land in St Werburghs – previously notorious for fly tipping, arson attacks and hard drug users. The ‘swoop’ to take the land started with activists forming a walking block and cycle block, trailed by an obligatory police presence. After a wild goose chase to lose the cops (who eventually got bored and wandered off), both teams took the site at about midday. The first day was spent clearing the site of rubbish, yielding a plethora of waste building materials which have been put to good use with tyre walls for an earthship being constructed, two composting loos on the go and recycling facilities sorted. St. Werburghs is known for being a ‘green’ part of Bristol with a city farm and a number of self-build eco-houses nearby, so the neighbours to the site have responded with gusto. Residents have donated tools, a grey water system and polytunnel, as well as plants and seedlings, which were planted with help from the kids from the primary school opposite. Police have reacted positively to the squat and offered their support to help prevent a planned illegal eviction, and after a good turnout of supporters, the bailiffs didn’t show, having been served notice that the eviction would be illegal under common and criminal law. Another attempt to evict is expected soon, so campers are urging people to continue to respond to call-outs. The collective plans to set up the site with buildings and a flourishing garden, then leave it for the local community to enjoy before moving on to another piece of derelict land which needs regeneration. The camp invites all visitors to come for the day or to stay for longer – so grab your tools and gardening gloves and get down to help green-up an urban wasteland. 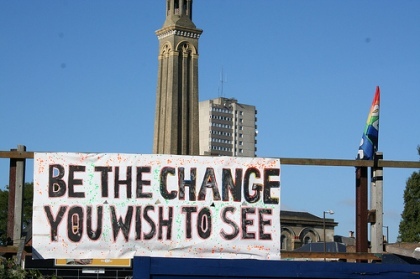 The Bristol project was inspired by green-fingered activists in London who set up an eco-village at Kew Bridge in June 2009. This provided an example of post-peak oil, sustainable, urban living created from capitalist society’s waste – creating a thriving community space which is still going strong nearly a year later. The two hectare site had been unoccupied for 23 years after failed development plans for an eight storey block of flats were continuously rejected at the planning stage. The land has been left alone by the landowners, who have not tried to evict the occupants, and by managing to keep the local residents and police sweet, the camp is now a hub of community interaction. There is a packed weekly itinerary of workshops including permaculture, cookery and art, wild food walks around the local area, public meetings and guided tour open days. The site is also a launch pad for protest with people getting involved with demos like the anti-Counter Terror Expo action (See SchNEWS 718), and the village is closed on Mondays as the occupants go and demo outside the MOD and ’emanate love’ to promote peace. With 30 permanent residents, nine of whom are original crew from the swoop at the site, they also welcome visitors with a custom built guest house if you want to stay (though call first to check if there’s space), and encourage all to come and help with the community vegetable and herb garden or just chill out. The action of squatting unused land based on principals of harmony with the land and equality goes back further to before anyone had even come up with the genius idea of abbreviating ecology into a soundbite, and when villages had composting loos as standard. The Diggers movement from 1649, a network of communes which reclaimed land after the English Civil War, has been heralded as the prime inspiration for all of these modern day actions. Following the execution of Charles I, the Diggers started in protest against the treatment of the common people who had fought and died for a supposedly more egalitarian parliamentary system, while the MPs lived in luxurious comfort (sound familiar..?). The network however was quickly squashed by the military who went round smashing up all the settlements (ditto). 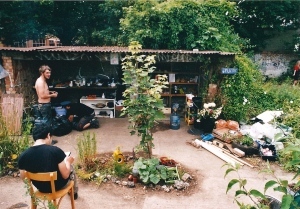 The Bristol Eco-Village is on land between the M32 and Saxon Rd, Bristol, BS2 9SH – for map see http://wtp2.appspot.com/wheresthepath.htm?lat=51.469250…oz=10%3E. For more info and contact details see the Facebook group: Bristol Eco Village – the Urban Centre for Alternative Technology. The Kew Bridge site is at 2 Kew Bridge Road, Brentford, TW8 0JF, site mob 07967864370 see Kew Bridge Eco Village! on Facebook and http://kewbridgeecovillage.wordpress.com. The Lewes Road Community Garden in Brighton has been an oasis of green on a grinding high street since last May (See SchNEWS 680) www.lewesroadcommunitygarden.org, see also Facebook group of the same name. This entry was posted in Whole Earth and tagged eco living, environment. Bookmark the permalink.